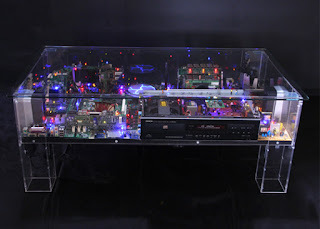 Electri-City - The Miniature City Inside a Coffee Table | TonerGreen - Eco-Friendly Toners from the U.S.
Have you ever wonder if there is something "extraordinary" one can come up using obsolete electronic parts like circuit boards...especially geeks and techies who don't have the heart to simply throw any electronic parts away? Well then, brace yourself because for today's article, I'm going to show you a one-of-a-kind e-furniture which is surely an eye-candy to fellow geekazoids like me. Electri-City is a miniature sci-fi world rather city made of recycled circuit boards, old VCRs and computer components which can amazingly display digital images, play music, access email and run a train set. Unbelievable, right? Its creator Benjamin Yates described the Electri-City in his official website as "a miniature cityscape made from recycled printed circuit boards and other waste electronic components with an integrated lighting system, all contained inside a sturdy acrylic and glass coffee table... Utopian or dystopian, the Electri-Cities are as entrancing as they are intricate and will draw people back again and again." "The futuristic tables reimagine antiquated electronics as streets, houses and miniature people to "conjure an image of future society 'that resembles the neon-lit cityscape from Blade Runner'," wrote Lidija Grozdanic in her post at Inhabitat.com. 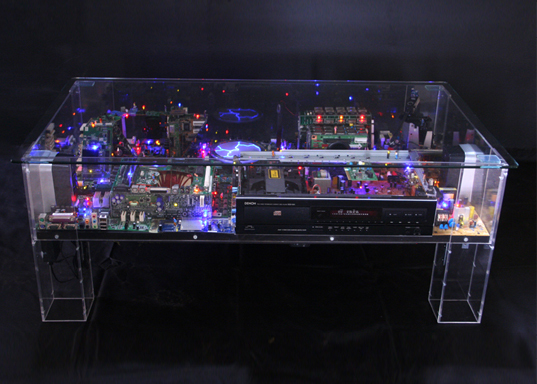 PrintGreen, on the other hand, described the Electri-City as "an exquisitely designed coffee table with a futuristic looking cityscape, all made from used and worn out electronic components." Incorporating a unique, techie design the Electri-City introduces us a new way of re-creating the conventional furniture through using scrap of electronic parts we once thought to be waste. In such a way, one could help in protecting our environment from the damages that e-wastes can bring to our landfills. With cutting-edge technology our present science can offer, it's not impossible that the chances of improving our way of recycling and re-using things can improve as well. Speaking of useful recycled materials, TonerGreen, the leader in providing environmentally responsible printing solutions, recycles toner cartridges and ink cartridges to contribute to energy conservation, sustainability, and environmental responsibility, and sale it as eco-friendly printer cartridges. TonerGreen intends to help you make eco friendly choices for your home or office with the confidence that you are making a smart and responsible decision.